I'd like you to meet Carol Miller. We met on my visit to the Des Moines Quilt Guild when she attended a couple of my workshops. I got to talking about what life was like for ordinary prairie women in the 1800's (what a surprise...I know!) and Carol told me about her passion for mourning jewelry. I had read all about mourning jewelry in Early American Life magazine (Feb 2004 issue) but had never seen any in person. Carol offered to bring her collection to class the next day. We had no idea what a special display we were in for! Early American Life magazine tells us that mourning jewelry arrived in America with the colonists, but it was in 1763 that New York jeweler, Charles Olivier Bruff, hired a London hairworker to create mourning jewelry with hair of the deceased worked into the pieces. At first, the hair was tightly woven and/or braided and inserted in the back side of lockets and brooches, or placed in the back of framed portraits. Gradually, the hair designs were moved to the front of the jewelry pieces for a more visible presence. Mourning jewelry became so popular, that long before he died, George Washington cut and saved locks of his hair for his wife and family. A mourning ring, circa 1800, and a miniature pendant with George's hair (belonging to Martha) is part of the collection at Mount Vernon. Hard to believe that this piece in Carol's collection isn't swirls of paint, but is in fact hair! This is the earliest piece in her collection, dating from sometime in the 1700's. All of the motifs inside the pin were formed from hair. As you can see, these pieces say "In Memory Of" and have locks of hair in the center cabochon. The hat pins have hair in them as well. In this photo, all of the dark and medium brown braiding and roping is real hair! See the earrings on the left with the open weave in the middle....all hair work! (The woman in the photo is wearing a pair of earrings exactly like those!) The medium brown interlocking piece at the bottom of the photo with the gold plates is all made of hair. It was worn by a man around this upper arm as a remembrance of his departed wife. Again...all the twisted and braided pieces are hair work. Note the round pendant mid-way on the right that has a bit of blue, beige and red. Carol told us that the blue is blonde hair that turns that color over time....making brown hair more desirable. Who knew blonde hair would turn blue? The long piece just under the locket was made for a man using his wife's hair. He used it to secure his pocket watch, and therefore, could touch his wife's hair when looking at his watch. Here's a closer look at the braiding and different twists of the hair. Isn't the locket lovely? Carol volunteers at a local living history museum and demonstrates how mourning jewelry is made. She uses horse hair, but has made a few pieces using her own hair. Most of us may not be looking for mourning jewelry made from our deceased loved ones locks, but knowing about this 1800's tradition is a good thing. Getting a chance to see it in person was really great as Carol has a wonderful collection. My heartfelt thanks to Carol for taking the time to share her collection with all of us! Good to Visit ~ Good to be Home! Last week, I had the pleasure of visiting the Des Moines Area Quilter's Guild. Two lectures and three workshops gave me lots of time to get to know some of these very talented ladies. We talked about the "prairie women" and "making-do", and some shared stories of my favorite (and their) bygone eras. I just love spending time with quilters! We shared piecing hints and tips and laughed a lot. They all gave me a very warm welcome and I hope to return again. I love the Des Moines area! I was sooo happy when one of my favorite people in the whole world surprised me with a visit! Jody Sanders, who is a very, very talented quilter, Prairie Woman, and jewelry artist (not to mention Editor at American Patchwork & Quilting magazine) really shocked me when she came to my lecture!! Such a nice surprise!! I wish I had more time to visit with everyone. In my next post, I'll show you something truly unique and wonderful from the 1700 & 1800's that one of the guild ladies shared with me! Don't miss it! As many of you know by now, Lynne Hagmeier (Kansas Troubles Quilters) and I host our Great Girlfriend Get~Away retreats from time to time. 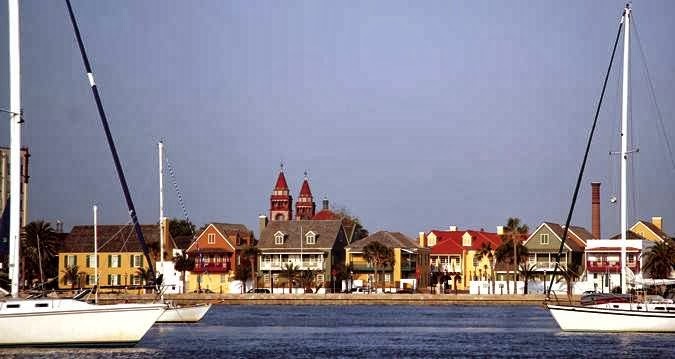 Next year, we'll be hosting two retreats...the first being held in historic St. Augustine, FL this coming January 20-24th. Our travel and retreat promoter, Bunny, told us today that we have only 8 openings left!! We have a wonderful group of ladies who are making this trip with us and plans are already underway. Fabric is being ordered and cut, supply lists printed, we're scouting boutique shops and restaurants, and dreaming of the fun times we're gonna have! We know there are at least a dozen of you that have talked with Bunny and said you want to come....and we want you to! So, please....call Bunny today to make your reservation. We will close this trip to reservations as soon as it's sold out or by December 1st, which ever comes first!! 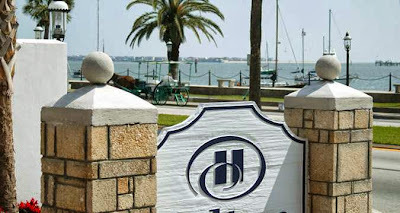 We're staying at the lovely Hilton St. Augustine's Historic Bay Front Hotel! We're located right on the ocean where there are tons of quaint shops and yummy restaurants accessible from the free trolly! 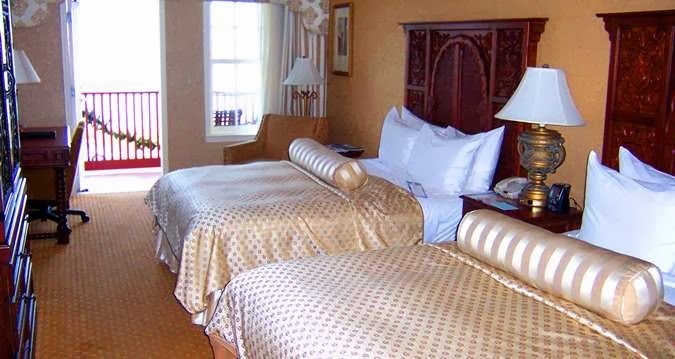 Your retreat package includes your double occupancy room, four breakfasts, three lunches and a pizza party! Oh...and how about FOUR classes AND the kits to go with them!! All for $725 per person. Heck....check out the Hilton's website...the room alone is over $900!! What a deal!! Click here for all the info on our St. Augustine Get~Away. You can contact Bunny Nelson at (815) 715-8483. We'd sure love for you join the fun. As reported in my previous post, I'll be away from home all next week, so I'll won't post again until I return. Until the....hope you find time to relax and doing some sewing! 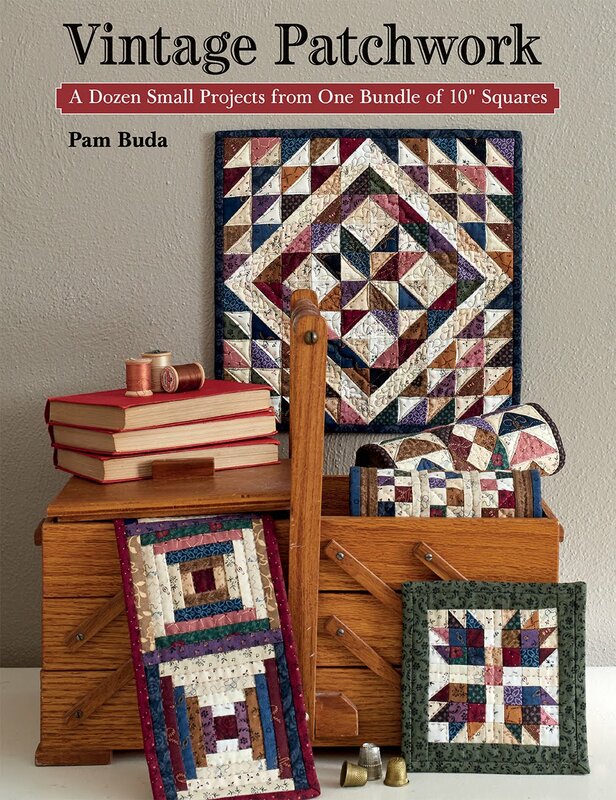 Next Tuesday, October 22nd through 24th, I'll be visiting the Des Moines Area Quilt Guild! Visiting guilds and shops are one of my all time favorite things to do! On Tuesday afternoon, I'll be giving my "Secrets of Professional Quilters ~ Revealed" lecture, where I talk about the best piecing hints, tips and tricks that I've learned over the years from my fellow teaching professionals, along with a few of my own. It's an informative and fun lecture. 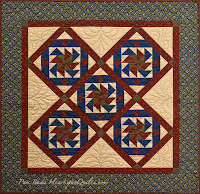 Later that evening, I'll be giving my "Making~Do; Honoring Our Quilting Heritage" lecture, teaching the differences between a true make-do quilt and a scrappy quilt, and why it's so important to know about make-dos. 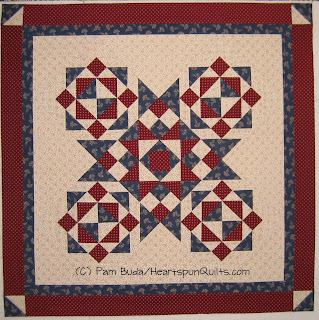 On Wednesday, we're going to "Practice What I Preach" in my lecture with a day of hands-on work going over the best hints, tips and tricks while we create the red, white and blue quilt pictured above. 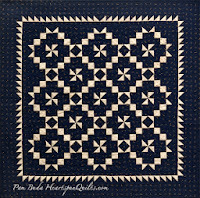 If you're short on time, you can go for the short-cut option to prepare just what you need to learn all the techniques I'll be teaching and not make the quilt. You still have plenty of time to prepare...and there's so much to learn! On Thurs, I will split the day with two more workshops! 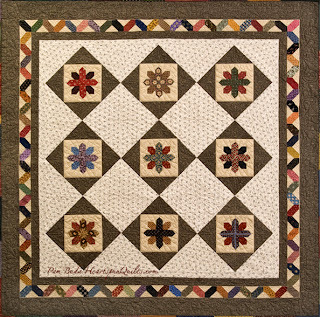 The first workshop is "Friendship Blooms" learning the fundamentals of English paper piecing making this sweet little quilt. 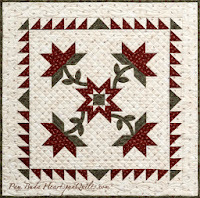 That afternoon, we'll be learning about foundation paper piecing as we make my "Star Strings Pincushion" using a pile of scraps. The Des Moines Area Quilt Guild invites YOU to join the fun! You are welcome to attend both lectures at 1pm and 7pm on Tuesday at the West Des Moines United Methodist Church, 720 Grand Ave in West Des Moines. 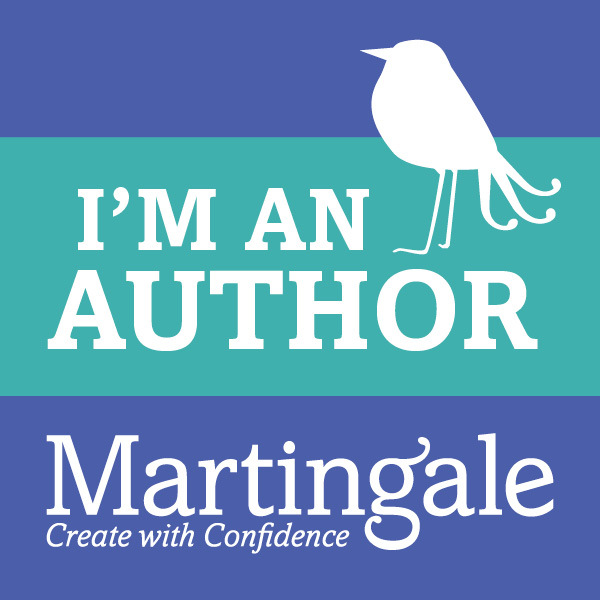 There are just a few openings for my workshops on Wednesday and Thursday, even if you're not a member! Workshops are held at 4501 Mills Civic Parkway, Bldg 3, in West Des Moines. Click here to get all the info you need! I'll be home for the remainder of the year, but pick up a busy schedule of visits in 2014! In January, I'll be visiting Village Dry Goods in Bringham City, UT, then on to The Great Girlfriend Get-Away with Lynne Hagmeier (of Kansas Troubles Quilters) and our many girlfriends in St. Augustine, FL. In February I'll be teaching at the Valley Ranch Retreat at the Woodbine Inn in Camp Wood, TX, and in March, I'll be at the Rossville Quilt Retreat and Quilt Shop in Rossville, IN, then onto Quilt Market and other fun destinations later in the year. I hope we get to meet one another sometime soon! 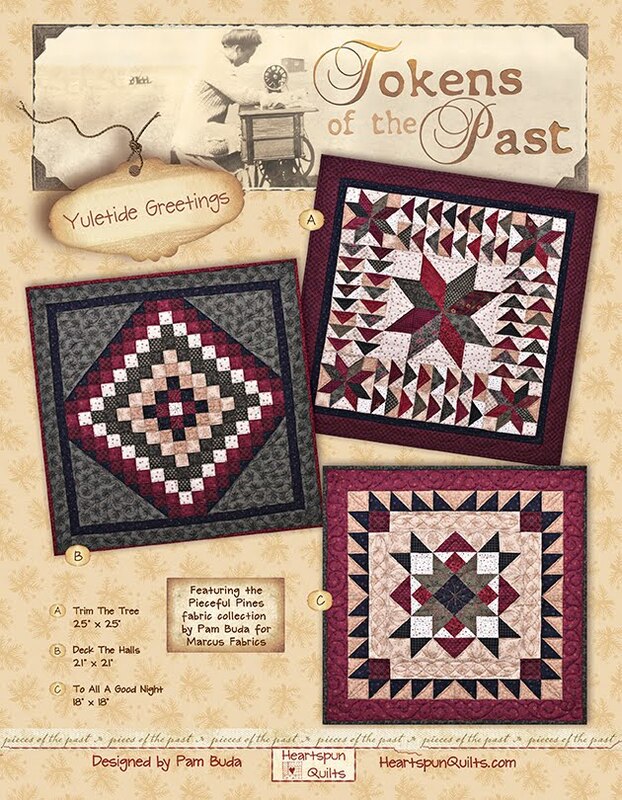 Here's a friendly reminder to finish the Nabby's Dowry Sew-Along quilt tops and send me a photo by December 1st for the "Airing of the Quilts"!! Pictures are already pouring in, and oh my, there are wonderful quilts to show you! I really want to include YOURS! 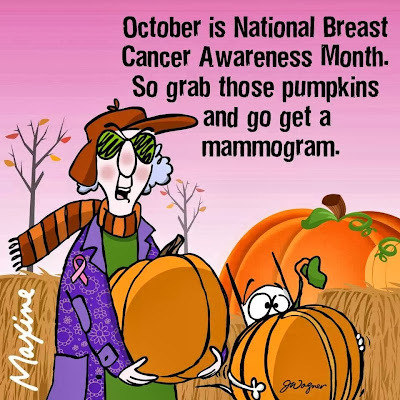 Remember, it doesn't have to be quilted or bound! Our Marcus Fabrics home office is all a buzz with excitement over the Just Judie campaign. 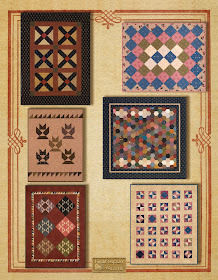 The 25 quilt finalists were chosen a few weeks ago, and the Grand Prize winner was announced. 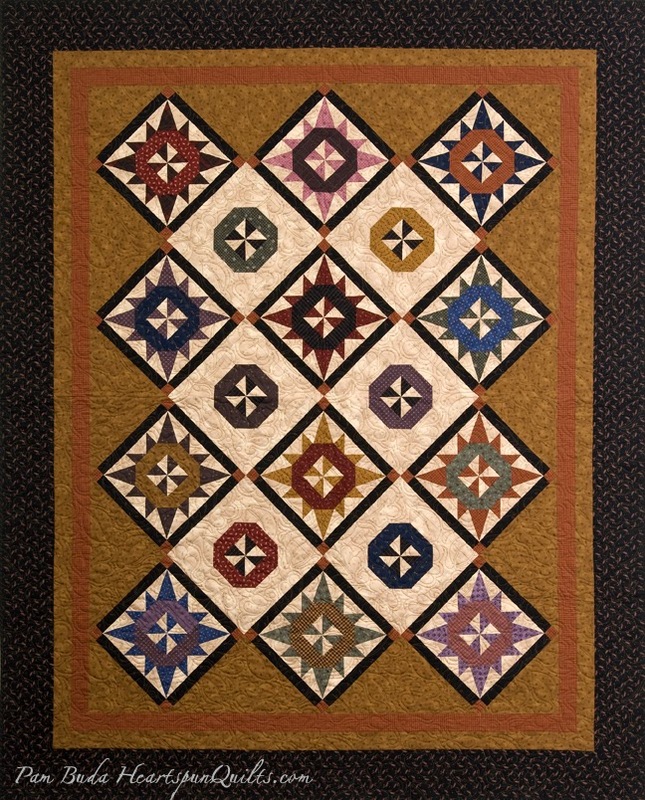 The winning quilt, pictured above, took the Grand Prize, and it is grand! 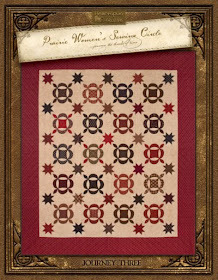 Lisa Even, of Barrington, IL, made this quilt....she's a fellow Land of Lincoln girl like me! And...guess what? The shop that sponsored Lisa is my favorite local quilt shop, The Quilt Merchant in Winfield, IL!! 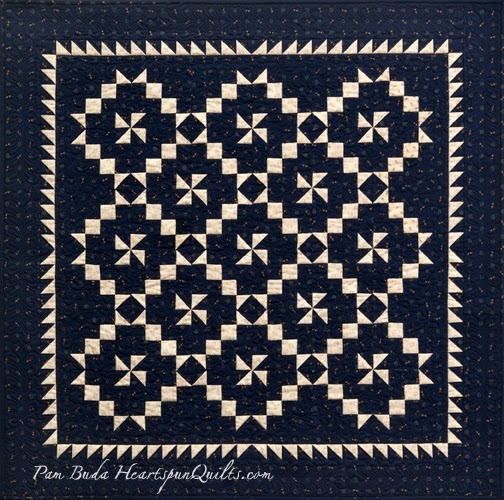 Treat yourself to some spectacular eye candy by visiting the Marcus Fabrics Blog to see all 25 finalist quilts. 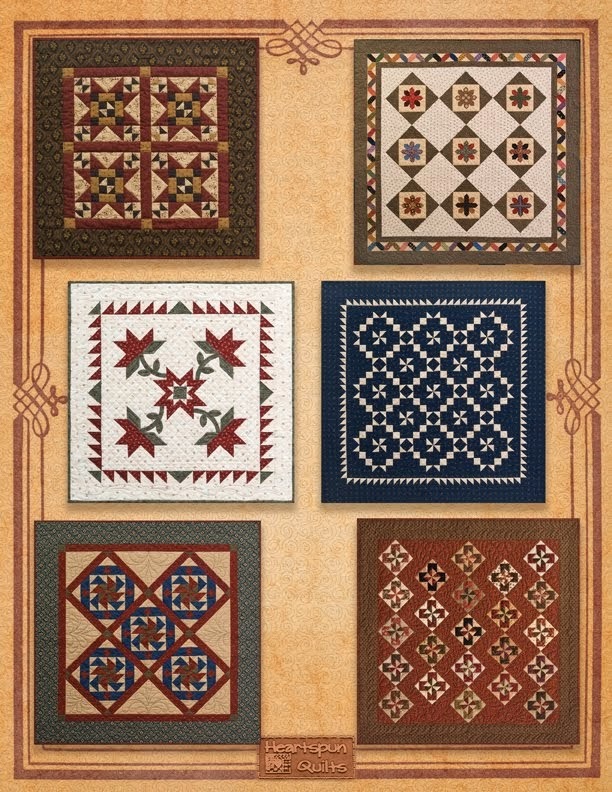 Which quilts would get your vote? I have my favorites!! 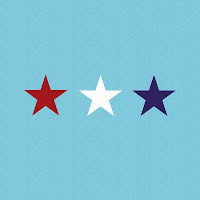 I make it my policy to stay far away from talking about politics on my blog, but today I'm making an little exception. I was surprised to find an email from Starbucks in my inbox this morning asking to sign a petition to send a message to our representatives in Washington, D.C. to start talking. Hhmmm....sounded good to me. It's done in a very respectful way and at least I feel like I was doing something other than shaking my head at the TV. What do I have to loose. Click here to visit the website to read about this petition. And...in the words of Forrest Gump (my personal hero)..."that's all I have to say about that." On another note....for those of you who emailed me asking when American Gothic Fat Quarter bundles would be back in stock.....they're here!! Click here to order. Introducing ~ ~ Journey Five!! Prairie Women's Sewing Circle club!! Easily one year in the making, you can imagine how thrilled I am to show you the six new quilt projects and the new bonus project! The first and largest quilt is called The Freedom Quilt. 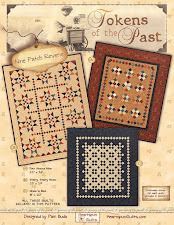 It features an original block and a great mix of fabrics from both the Pin Money and Prairie Woven collections. I think the block kinda looks a little like a Mariner's Compass. 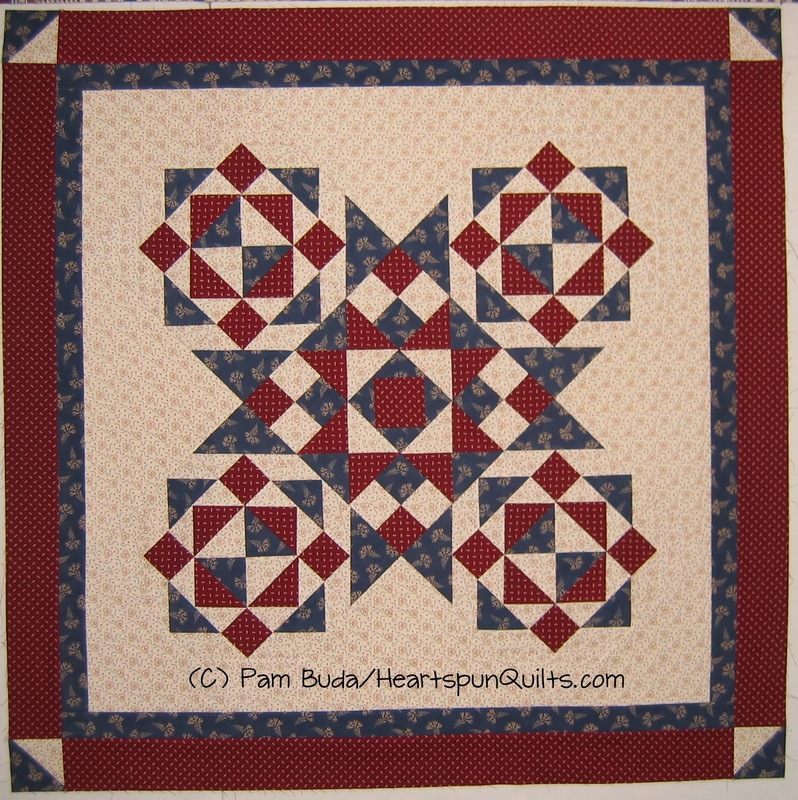 Next is a quilt called Pleasant Prairie. Aren't simple little quilt so much fun to make? 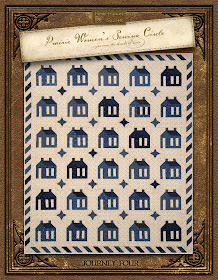 Pick a beautiful border fabric, then choose coordinating prints and sew this up in no time! 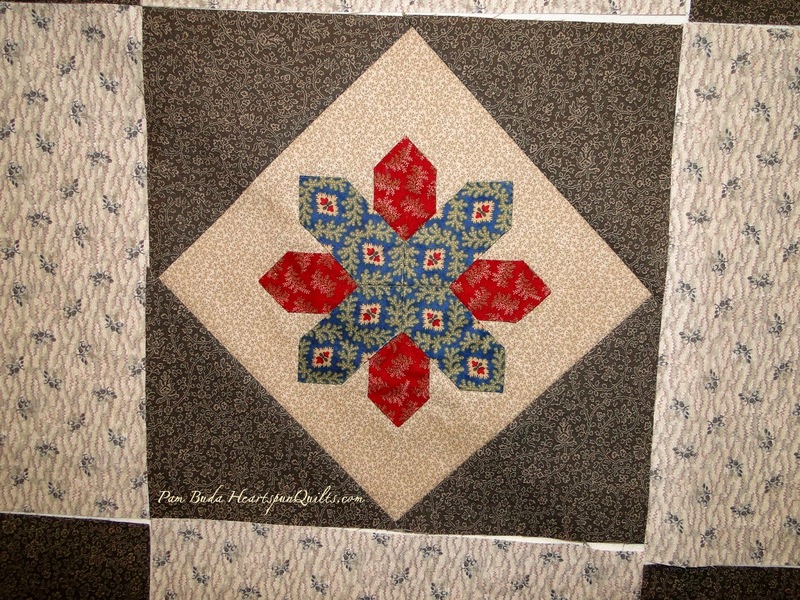 The third quilt is called Hope Chest Relics made from three of my Pin Money fabrics. 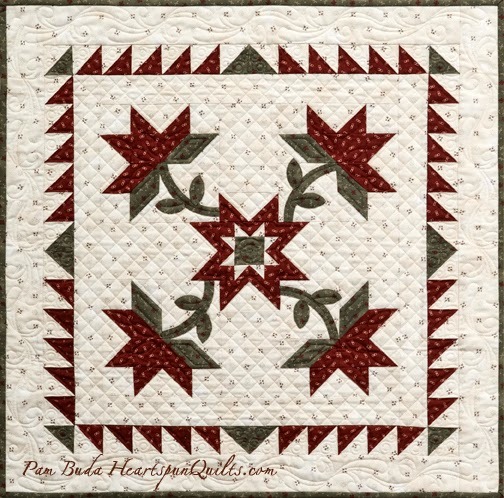 Oh how I love the antique Carolina Lily quilts in their red, green and white glory. This little quilt honors that tradition. The fourth quilt is called Something Blue made from two more of my Pin Money fabrics. Recognize this quilt? 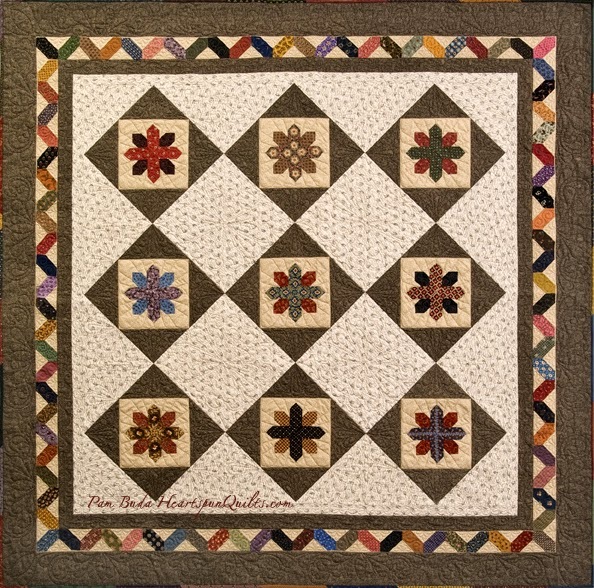 It's a smaller version of my larger Settler's Puzzle quilt pattern, which at the moment is only available if you take one of my workshops! 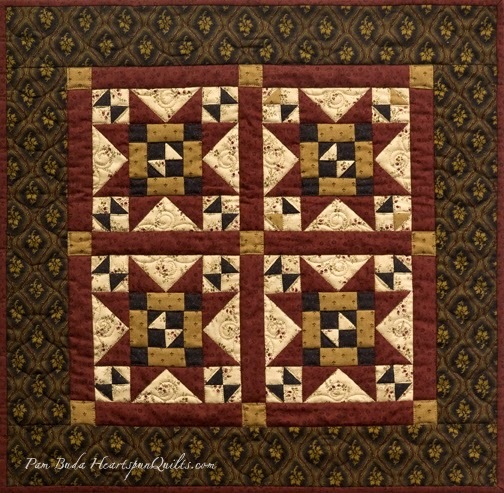 The fifth quilt is called Square Dance. The block is old and not often seen, and I love it. Love the name, too....Crazy Ann! 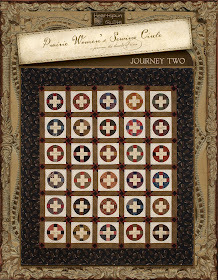 The sixth quilt is called Emma's Sewing Basket. I made a few changes to an old block and set it on point with the zig zag setting. Love, love red and brown together! 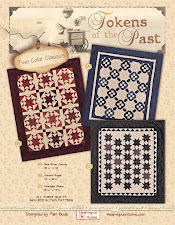 Can you tell what the historic stories are about from the quilt names? For the bonus project, I must admit it took some time for me to decide on what to do. It was time to introduce a new shape to work with while club meetings were going on. So many choices! 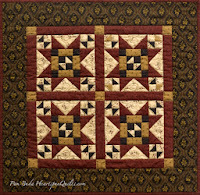 If you're like me, you've no doubt noticed on blogs, in quilt shops, and especially Pinterest...they are loaded with images of the awesome Lucy Boston: Patchwork of the Crosses quilt. I must admit, I was very taken with the wonderful fussy cutting blocks I was seeing, and inspiration struck! I decided to work with elongated hexagons and played and played until I decided on a simple, striking design for a block. 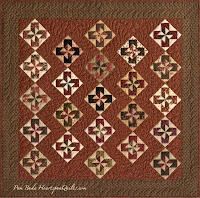 I deliberately used two neutral shades for the quilt setting so the hexie blocks and border would really shine through. Oh, did I have a grand time making these hexies! Now, I like a fair amount of hand stitching, and in the past have hand sewn all the hexies and the quilt together. A fine task when you have a lot of time, but I never do, so....this time, I used the glue stick. I figure if the glue stick was available in the 1800's, the prairie women would have given it a try...so what the heck! 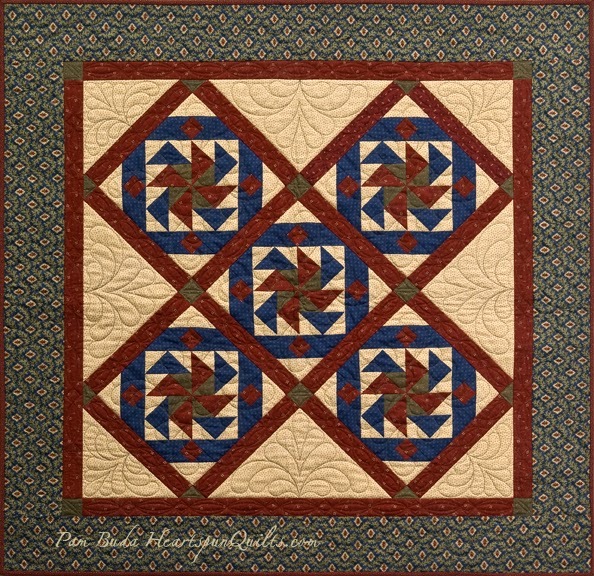 Winds of Change is the name of this quilt. Change was a constant thing in the lives of Prairie Women, and they had to adapt to all kinds of different situations....which as we know is a difficult task, especially when we're older. What you can't see in this photo is the glorious quilting. 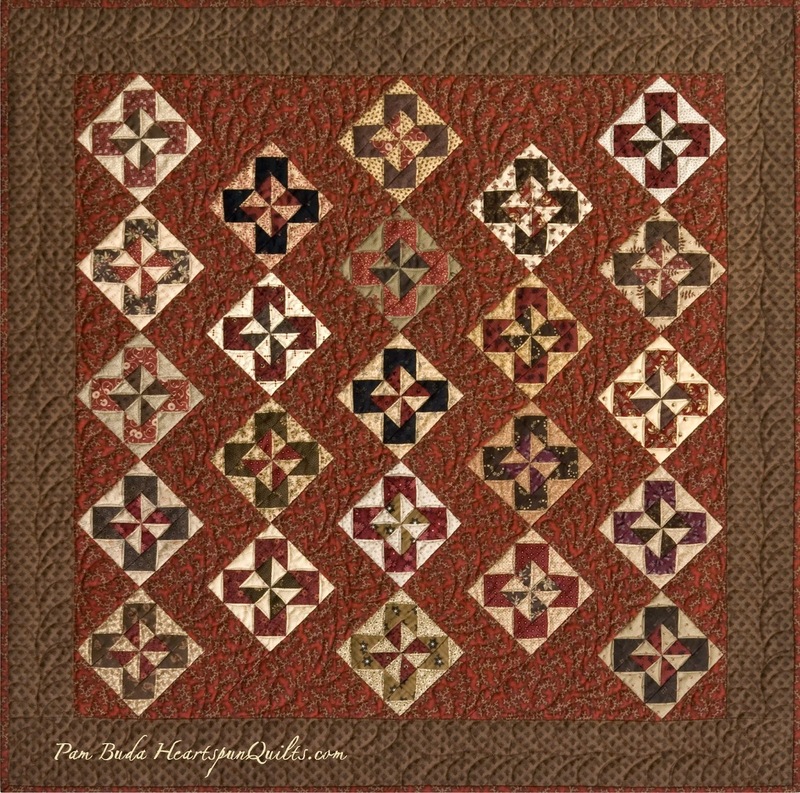 My pal and quilter, Ronda, out-did herself on this quilt. Sometimes, I like having "open space" in a quilt where the quilting can be the focus instead of more pieced blocks, and I got just what I was hoping for! After completing the top, I handed it to Ronda so she could work her magic. Then, I left for Washington, D.C. While I was gone, Deb (my pal who works with me) picked it up, bound it for me, and dropped it off with my photographer, Dan. I brought it home and enjoyed it for one hour...one hour....then boxed it up, along with the other six Journey Five quilts, to send to my local quilt shop, The Quilt Merchant. They are hanging in shop in case you'd like to stop in to see them. 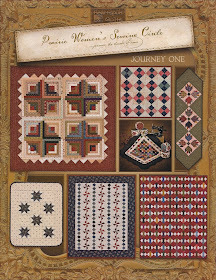 (By the way, I'm teaching Journey Five at The Quilt Merchant starting Saturday, October 12th! We'd love for you to join the fun.) I'll try take some good pictures (emphasis on the "good pictures" part as you know what a poor photographer I am) of the quilting on the Winds of Change quilt. It's fabulous! 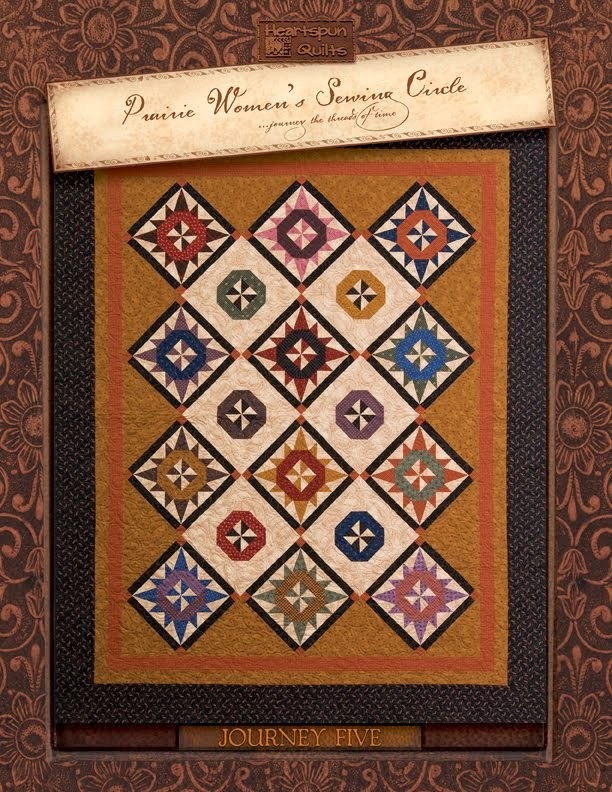 If you like what you see and are interested in joining the fun, ask for The Prairie Women's Sewing Circle club at your favorite local quilt shop! 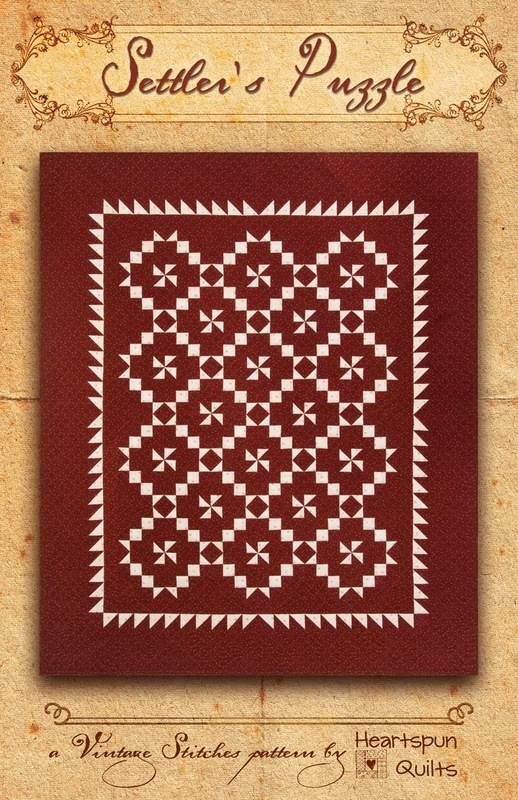 The Journey Five patterns are only available from a participating shop!! Thanks for sharing in my celebration! 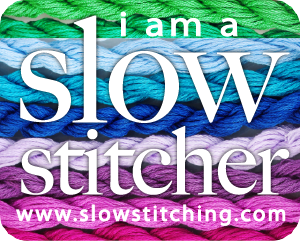 Wishing you very Happy Stitches....off to do a happy dance. 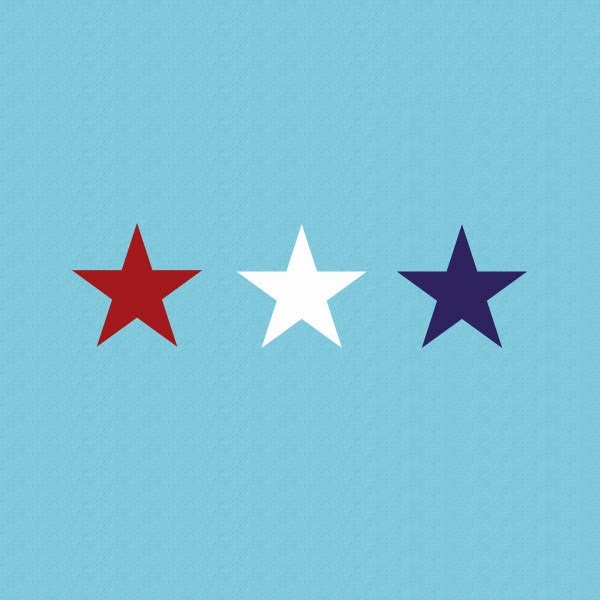 If you're ever planning a trip to our nation's capitol, you won't want to miss the opportunity to view some of the quilts in the Smithsonian's museum of American History!! This was one of the highlights of my trip, to say the least. 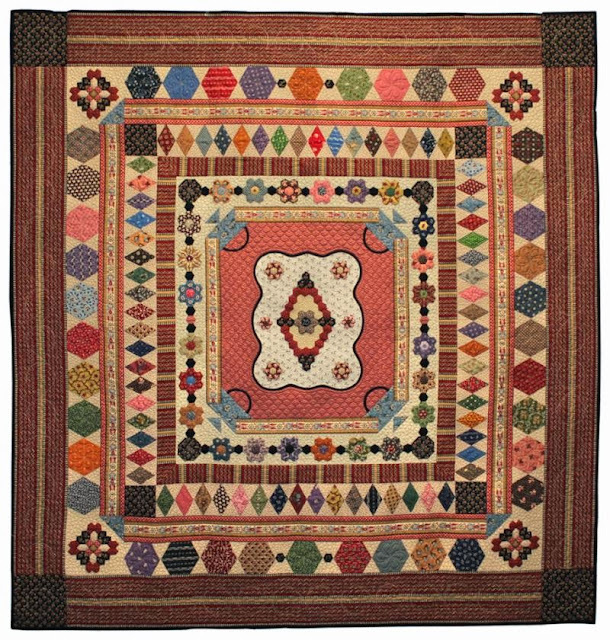 The docents of the museum's quilt collection will take a very small group for a behind-the-scenes viewing of up to 30 of the museum's 300+ quilts in the national collection. This opportunity is available on the second and fourth Tuesdays of each month, except in January, December and federal holidays. Space is very limited, so the earlier you plan your trip, the better. Reservations will be taken up to six months in advance. If you get the chance to go more than once, you'll see different quilts in the collection! As with most items on view in a museum, unfortunately, and quite understandably, you can not touch or photograph the quilts. In a climate controlled room, deep inside the museum, the quilts "live" tucked away in a these cabinets. Each cabinet opens to reveal lots of sliding trays that hold each quilt. Most are laying flat, but some are folded, all kept in an acid free environment with other very interesting techniques employed for conservation and protection. That said, it is a thrill to be inches....inches (!!) away from the quilt Martha Washington pieced! 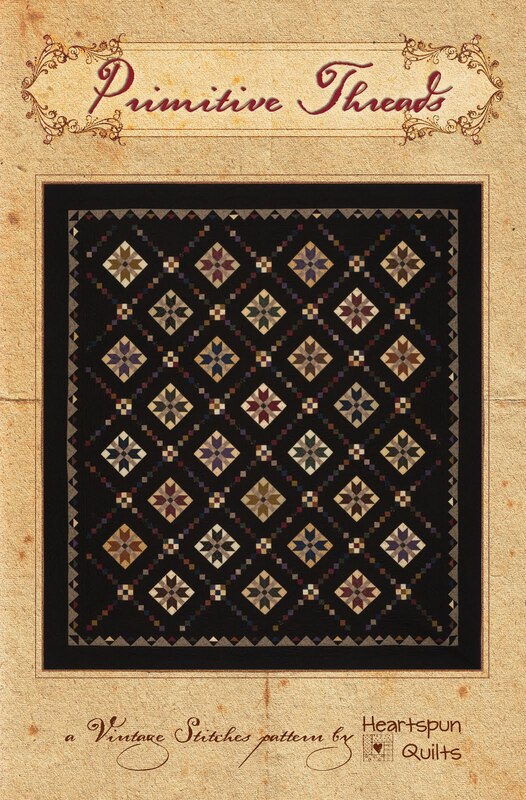 I saw many other famous quilts such as the Benoni Pearce (1850) quilt, which is featured in many, many books, Mary C. Nelson's Eagle (1846) quilt, and Mary Rockhold Teter's (1861) Stars and Stripes, to name but a few. There were whole cloth, crazy quilt, Baltimore album, pieced, applique...you name it, with several quilts bearing signatures of many eighteenth century presidents. Now....for the important stuff. If you'd like to see the quilts and go on this wonderful behind-the-scenes tour of the Smithsonian quilts, you can email Doris Bowman (email: bowmand@si.edu) or call the Textile Collection at (202) 633-3798, to make your reservation. 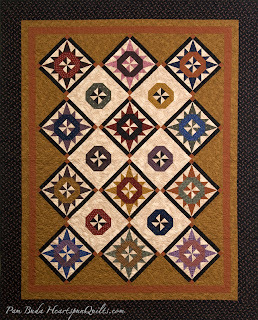 If you can't make it to Washington, D.C., you can view many of the quilts in the museum's collection. 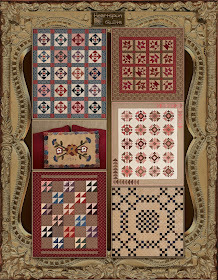 They are slowly but surely working to add all of the quilts to the website. 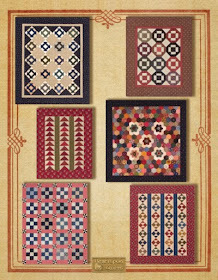 Click here to see the Smithsonian quilt collection. Now....back to work. Watch for a BIG announcement coming next week! Last week, my hubby and I visited our nation's capitol. It was my first time there and we planned a full week of touring. It was one of the best vacations we've ever enjoyed. I wanted to go in September because I was hoping the weather wouldn't be hot, and it wouldn't be too crowded as all the kids were back in school. Boy, we were blessed in every way! We had perfect weather...in the 70's all week. No rain, no crowds, no waiting in line...it was as if we had DC all to ourselves! We heard, a bit too late, that we should have dropped a note to our representatives for tickets to tour the Capitol, etc., and we just didn't get around to doing that in time, so we figured we'd have to take our chances and wait in line. Not so in September! We were able to book a tour of the Capitol building the day before, and we never needed another ticket, or waited in any line at all for any of the things we wanted to see in D.C.
We flew into Baltimore (better fares) and drove to see Annapolis, MD on our way to Washington. Not only did it save us some money, but it served another purpose for me in visiting another state, and crossing that one off my bucket list. We had a wonderful dinner at The Severn Inn across the river from the Naval Academy. What a great town Annapolis is! I also visited the one and only quilt shop on this vacation, Cottonseed Glory. After dinner, we headed to Old Alexandria, VA to our hotel. For the next three days, we walked, and walked, and walked, and took cabs, rode the Metro, and saw as much as we could see. We visited The White House, The Mall and all of the memorials, Ford Theater, and the house across the street where President Lincoln died, and Arlington National Cemetery. The National Archives were just awesome, where you can view the Declaration, Constitution, and Bill of Rights...quite humbling. We toured the Capitol, and were able to sit in the gallery of the House of Representatives. We could have done the same with the Congress, but it wasn't until later in the day, and we didn't want to hang around. We ate great food, visiting Old Ebbits Grill twice (Ed's favorite for their raw bar), and were serendipitously treated to a visit to the rooftop penthouse where we got an extraordinary view of all of DC, as well as the White House as it was only one block away. Our last two days were spent visiting Presidents Monroe, Jefferson and Washington's homes. We did book tours ahead of time there, and highly recommend taking the "Behind the Scenes" tour of Jefferson's Monticello. They don't allow you to take photos except for the out-buildings, which in most cases were the kitchen houses. For this Prairie Girl...I was intrigued to see the kitchens! This was fancy living for the eighteenth century! Still....you can't help but imagine cooking in these kitchens. Just looking at the ironware in the fireplace leaves me scratching my head. Add to that wearing those dresses with all those layers. Those were some hearty, hard working people! We spent our entire last day at the Smithsonian American History museum, spending the morning with the docent of the quilt collection. I'll tell you all about that in my next post!